The Sunny Magnetic Rowing Machine is an affordable model for combining cardio exercise with whole body toning. It's not the most impressive rower out there, but it has become quite popular since its introduction. The electronic monitor displays time, speed, row count, calories burned, and scan. Length / Height: 82" x 23"
Check out the popular Magnetic Rower on sale now at Amazon! Reviewers on the Sunny Magnetic Rowing Machine point out that the adjustable resistance settings from 1 to 8 do not really provide too much tension at any level, so anyone in fairly good shape won’t feel like they can ramp up the resistance. Note that the up-level Air Magnetic model has better resistance capability. Also, the rail is too short to get a full pull, so the thought of going for speed in an aerobic workout can mean injury if you aren’t careful. The pull cord rests right above the footplates for a start point, so you won’t feel like you get a full stretch (unless you are a short person in which case this may not be a problem). The rest of the specs don’t offer much to review, other than to say there’s a lot of cheap plastic on the flywheel housing on this model. Also, there is an issue with the battery compartment design and a couple of reviewers mentioned that the batteries have fallen out and landed in the wheel mechanism. It wouldn’t be so bad but it takes some difficulty to get them out. It’s probably an easy fix with some duct tape over the compartment door, but you shouldn’t have to resort to preventive measures to cover a design flaw. The Sunny Magnetic Rowing Machine can be found online anywhere from $269 to $299. On the plus side, it does have a nice rowing motion in the pull cord, it’s solid, and it’s quiet. For a senior or a shorter person under 5'6" tall, who doesn’t row like an animal but only wants an occasional cardio workout – this machine might be a decent choice at the right price. 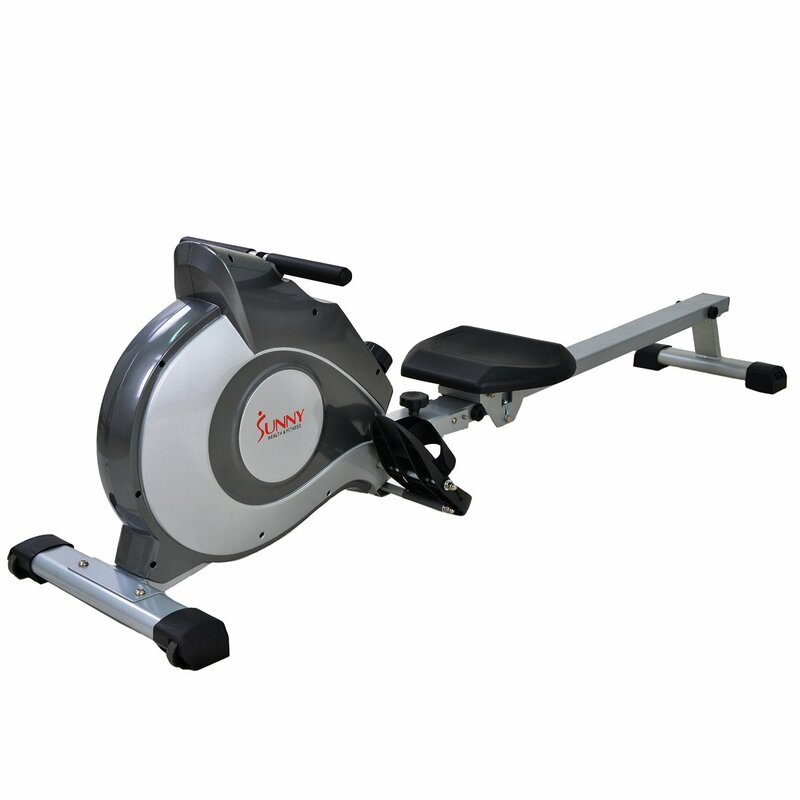 Also take a look at the base rower from Sunny if you want to save a little money.